WATER joins the Sisters of St. Francis of Philadelphia and the many friends of Sister Hope Bauerlin in mourning her sudden passing and rejoicing in a life dedicated to health, justice, and well-being for all. Hope died on July 24, 2018, having celebrated seventy years in the Franciscan community. Hope was a regular at WATER events especially mediation, a joyous presence in the office where she volunteered. She was a longtime member of the local women-church group, SAS (Sisters Against Sexism), whose members will miss her deeply. A nurse and nursing instructor, Hope became a lactation specialist later in her career. She helped dozens of young mothers learn to nurse their babies, always lending a practical hand and a loving heart to those for whom she cared. Hope was stalwart for social justice, joining in myriad protests, writing countless letters, and making endless phone calls to members of Congress in the hope of moving the needle for peace. She brought that spirit to her personal relationships, accepting each person on their own terms. We at WATER were thrilled to host her 90th birthday celebration when she was in town for the Ecumenical Advocacy Days. The office was decorated festively with food and drinks galore. Lots of people–women and men, young and old–from many facets of her life gathered to celebrate a grand person. When asked what she would like to drink, her immediate response was “champagne,” and champagne it was! 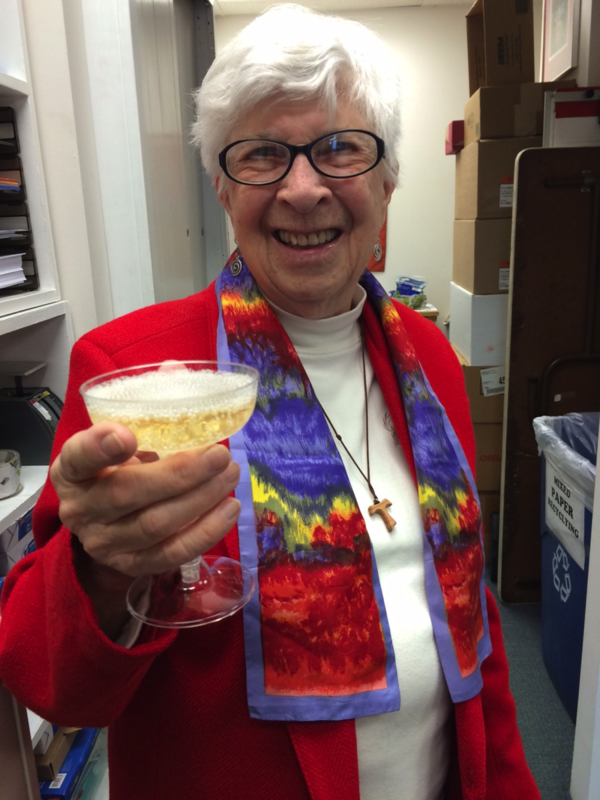 We lift a glass to a wonderful friend, a respected colleague, and a dear sister. Sister Hope Bauerlin, In Memory of Her. See link for obituary and plans for services to be held in Aston, PA, Tuesday, July 31, 2018. https://osfphila.org/obituaries/sister-anna-hope-bauerlin-dies-at-the-age-of-93/ .